Coffee. It’s the world’s most popular beverage (second only to water) and is important to many people in their daily lives. I, for one, can not even start my day without a steaming hot cuppa; the very thought of drinking coffee first thing in the morning is what gets me out of bed. 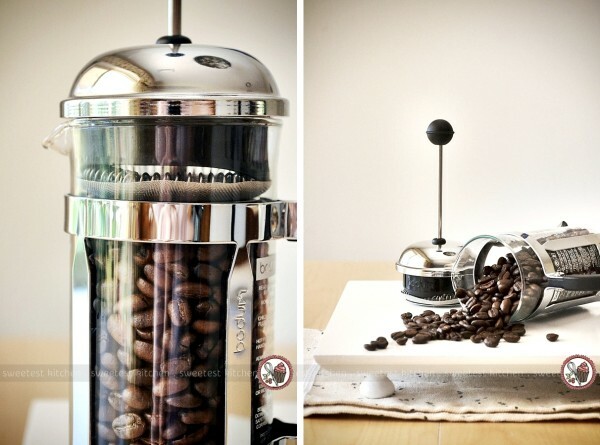 There are many different ways to make coffee, but I have always preferred the coffee press. I’ve noticed that a lot of people aren’t familiar with how to use a coffee press, so I thought this would be a great opportunity to share with you my method, as well as review some beautiful products from Kitchenware Direct, kindly sent to me by Brad Russell. First of all, you’re going to need a coffee press, like the classic Bodum Chambord pictured above. Mine is the 3-cup version. Of course, you’ll also need some coffee. I buy pre-ground coffee because I don’t have a coffee grinder; whether you buy pre-ground or grind your own, coffee presses require coarse, evenly-sized grains. If the grains are too small, they’ll escape the mesh filter which means you’ll end up with quite a bit of sediment in your cup and you may also experience a bitter taste. Okay, you’ve got your coffee press and your coffee, now what? Pre-heat your coffee press by filling it with hot water from the tap. This will help keep the water you add to the ground coffee hot. 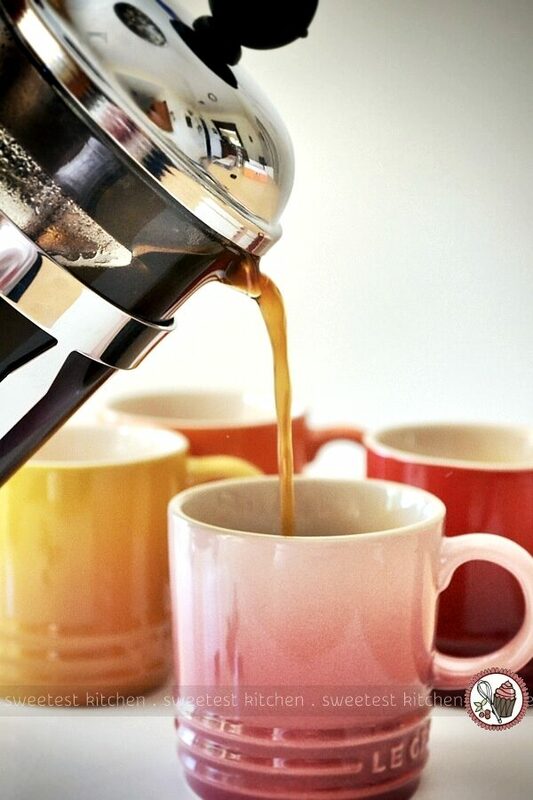 While the coffee press heats up, heat up the water you will use to brew your coffee. I use a Breville kettle that heats the water up to the ideal temperature at which to brew coffee, which is around 95C. If you don’t have any way to measure the temperature of the water, use water that has boiled and cooled slightly, or as I used to do before I got my kettle, use water that has almost reached boiling point. When the water has reached the perfect temperature, pour the hot water out of the coffee press (cool it down and water your house plants/herbs!) then add your ground coffee to the warm, empty coffee press. 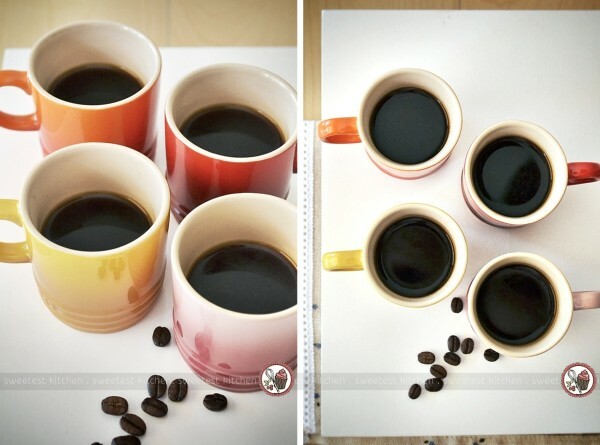 Here is where you can experiment to find what exact amount of coffee suits your tastes. Generally speaking, it’s about 1 rounded tablespoon of ground coffee per 4 ounces of water. This is basically the amount I use, give or take. Now, here’s where I vary my method slightly from others. I add salt to my coffee. Huh?? The salt helps to reduce some bitterness and results in a smoother taste. I use about a scant pinch of freshly ground sea salt (see?, in the first photo below!). I add the salt to the ground coffee before I pour in the water. This step is optional, but I encourage you to try it! You’re ready to pour in the hot water now. I fill the coffee press up to around the top of the metal rim around the outside of the press (as you can see in the middle photo above). Stir the coffee to make sure all the grains are in contact with the water; use a bamboo skewer or chopstick, as using metal utensils inside the coffee press can damage it. When your stir it, you’ll see the bloom start to form (middle photo above). Place the lid on top to help keep the water hot, but do not press the plunger down yet. Wait 3-4 minutes; 3 minutes is the magic time for me. Experiment to find your magic time. After the 3-4 minutes is up, ensure the coffee press is on a non-slip surface, like a tea towel, and hold your non-dominant hand over the lid of the coffee press, with the metal pole in the crook of your thumb. Using your dominant hand, slowly and firmly (and cautiously, as this is very hot water) press the plunger down until it reaches the bottom (although it won’t actually touch the bottom). If you find that the plunger is too hard to press down, you’ve used too much coffee, or the coffee has been ground too finely. Your coffee is now ready! 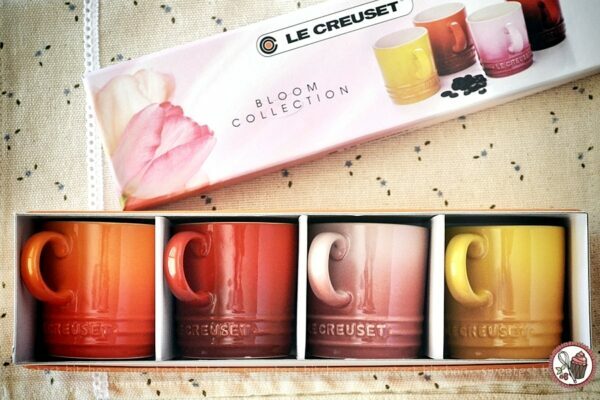 Serve immediately in these cute little Le Creuset espresso mugs. These little tiny mugs have been a real hit at our house and they’ve mostly been taken over by my daughter who insists on having a babycino every morning; she claims they keep her awake during school! I don’t have the heart to tell her there’s no coffee in it! 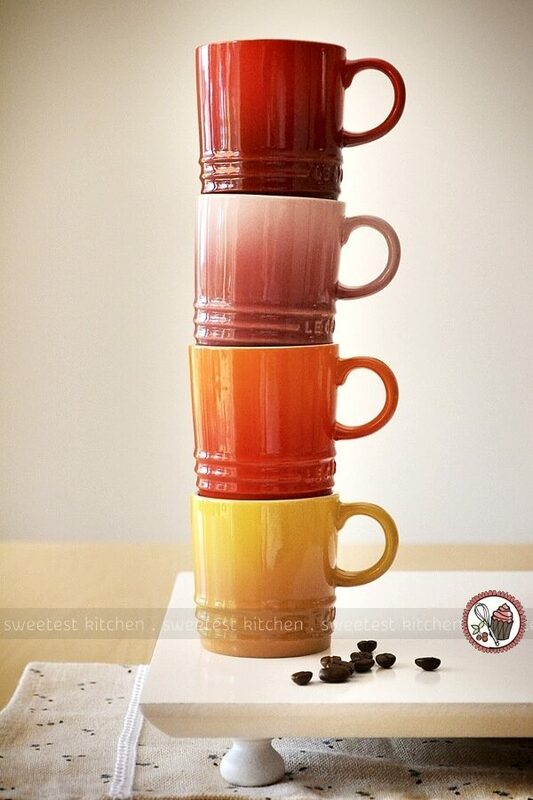 The mugs are indeed tiny, holding just 100ml, and are made from enamel-coated stoneware. They feel very sturdy and durable, despite their small size, and, of course, have the superior quality you’d expect from Le Creuset. They come in four gorgeous colours, which are reminiscent of spring. What I find is extra awesome about these mugs is that they are oven safe up to 260C, which means you can also bake tiny tea cakes or puddings or whatever in them! I haven’t done this yet, but keep a watch on my blog because it’s definitely on my to-do list. I do want to take a minute to tell you about the Bodum Chambord coffee press. I’ve used one of these before while living in the US and it was the love of my life. When I moved to Australia, I gave it to a friend of mine after making her promise to look after it and cherish it as I did. After moving to Australia, I used another Bodum coffee press (I believe it was the Kenya version, with the big ovals, only it was silver) but I longed for another Chambord. I simply loved the look of it and needed it in my life again! 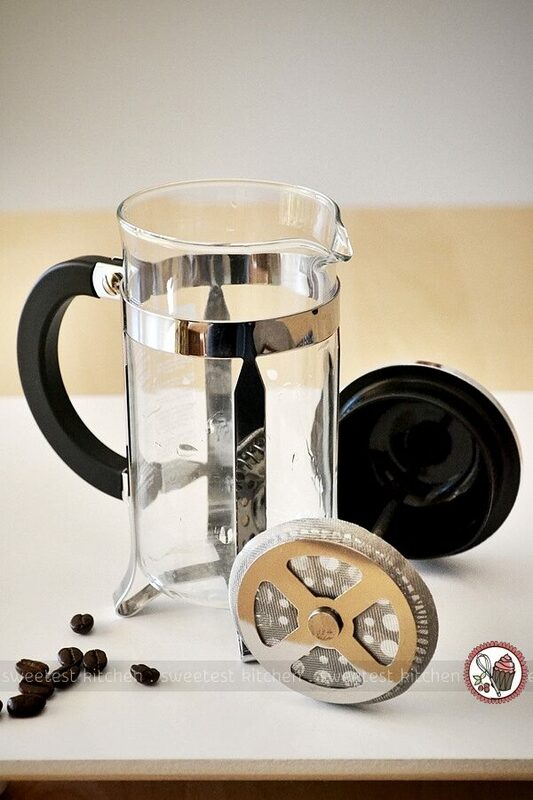 The bits of a coffee press are meant to be disassembled and cleaned each time you finish using it to prevent the buildup of coffee grains in the plunger. Even the glass carafe can be removed from the metal casing to be cleaned, which I recommend doing each time you use it as well. Be sure to dry the carafe and metal casing before putting the carafe back in because rust stains can form and are quite unsightly. Finally, here’s another example as to how you can use your coffee press – make affogato! This is simply a few small scoops of ice cream (in my case, vanilla bean ice cream with ripples of salted caramel), over which hot espresso is poured. You can also pour over a coffee liqueur, along with the espresso, for that extra bit of indulgence. There, see?, using a coffee press isn’t so hard, is it? 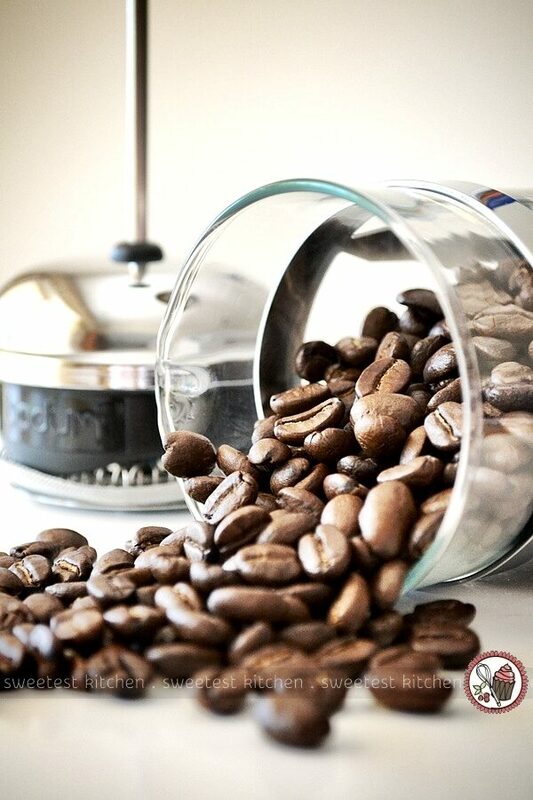 If you want to taste the rich, full-bodied coffee that a coffee press can give you, then why not enter to win your own coffee press and espresso mugs! A strong coffee made by me & had alone at my pace, watching tv is something I love the most. This normally happens early morning or late night as other times there is enough disturbance(two little boys) to topple over the coffee cup. Perusing the second hand markets with my dad on Sundays – he bought me a cup of coffee every sunday as a special treat. I always looked forward to those days with him! Oh and yes, I would very much like to win this. We are stuck using coffee bags at home. My best was when I was in 6th grade and was having dinner at an Italian restaurant in one of the casinos on the strip in Vegas. I ordered a cappuccino for the first time and when they brought it out it was in a tall fancy glass and came out with a plate of chocolate chips, rainbow sugar crystals and vanilla sugar. I felt like such a grown up but I do not order cappuccinos anymore because every place doesn’t do that so it’s not the same. My parents don’t drink coffee so I never considered it. Now That I am in college and about to graduate its a morning routine I dare not skip. I bought my mother one a few years back for her birthday & I so regret not getting myself one. I love this. Fingers crossed. Mmmm sounds good I’ve never made it this way. I started drinking coffee with my dad on the weekends, it was “our” time. When I was a teenager my mom would always make coffee on the weekends and we would spend the mornings going through ads and making the grocery list. Good memories. Every single first coffe of the day is a great one!! Best coffee experience was having a morning coffee each day in Rome with The Colosseum as a backdrop. Best coffee experience? Slow macchiatos in Siena, Italy, watching the crowds ambulate around what is possibly the world’s prettiest piazza! Some of my earliest memories involve coffee..it is so comforting for me! my first coffee experience was when I was about 10, I drank my moms coffee, she likes it black so I wasn’t a fan of coffee at first! but after a while I learned you could make it any way you want and learned to love it with some sugar & cream!